Marineland Melanesia is a unique attraction on Green Island; home to over 50 crocodiles, marine aquariums with coral, fish, giant sea turtles, and a magnificent range of tribal carvings. Also displayed are a number of old and restored marine artefacts and stationary engines. This family owned and operated business has been a popular tourist attraction operating on Green Island since the early 1960’s. Located just a short stroll along the path to the left of the jetty, look out for the iconic shipwreck entrance and gift shop. See exciting crocodile shows, you can even have your photo taken holding a baby crocodile! Marineland Melanesia is also home to Cassius - the largest crocodile in captivity. 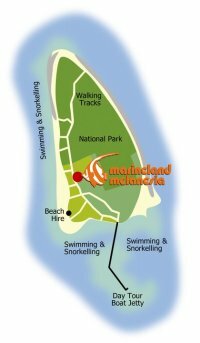 Before being bought by George and Shirley Craig in 1969, Marineland Melanesia was known just as "Marineland", first established in 1954. In 1971 'Marineland Melanesia' was established so the Craig family could share their love of crocodiles and tribal art from the Melanesian Region. In 1971, the Craig Family moved more than thirty crocodiles from the island of Daru (PNG) to take up residence on Green Island. The attraction has been proudly owned and operated by the Craig family ever since. 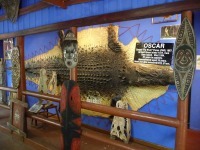 Family patriarch and former crocodile hunter, George Craig, is one of the most respected collectors with his lifetime's work on display at Marineland Melanesia. George is extremely proud to display his collection of priceless pieces, which he started collecting as a boy, plus his 17 years spent in Papua New Guinea went hand in hand with growing his collection. 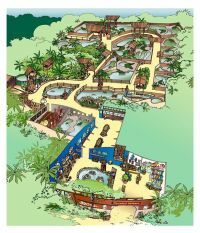 Marineland Melanesia was a vision that George set about bringing to reality, an island habitat for crocodiles, tropical fish and a magnificent range of carvings and ancient primitive tribal art. Over 40 years on, and four generations are still living and working at Marineland Melanesia. Over that time much has changed around us on the island, however the family are very enthusiastic about retaining the character of our family attraction. 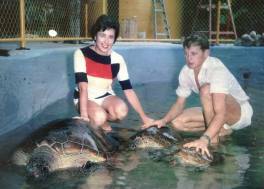 Most of the original displays and buildings at Marineland still exist today, such as the turtle pool. 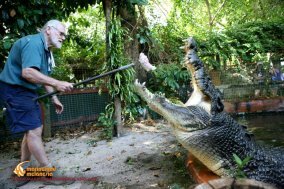 George still lives and works at Marineland Melanesia and is often around for those who would like to hear some stories from a true croc hunter. There are around 50 Crocodiles on display at Marineland Melanesia, from baby hatchlings up to living dinosaurs like Cassius! 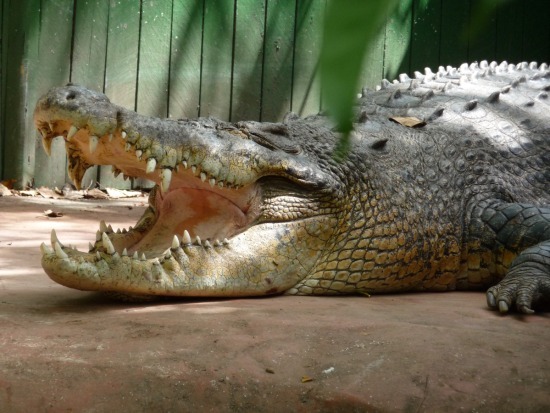 Not only is it home to the largest captive crocodile in Australia, Cassius, it is also home to one of the largest private collections of exotic Melanesian tribal artifacts and aquariums. 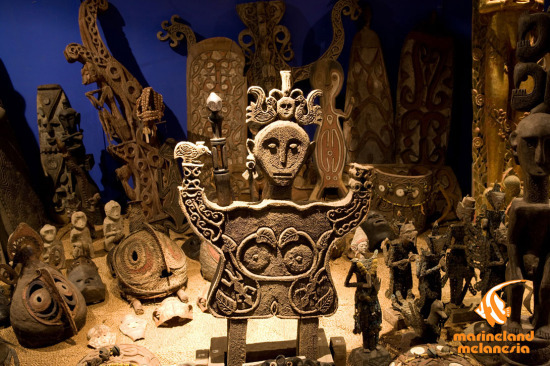 The G.J.C Collection is one of the world's most extensive collections of Tribal Art. 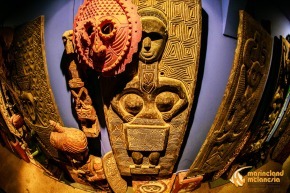 George J Craig's amazing private collection of primitive ancestral artifacts and maritime relics gives Marineland Melanesia it's special atmosphere. Maritime treasures include an enviable collection of turn of the century pearl diving equipment, and an extensive array of scrimshaw pieces - intricately hand carved whales teeth from the early days of sail. For the enthusiast, a small collection of stationary engines fully restored by Stephen Craig, will be an unexpected discovery. The aquariums were built to allow natural sunlight and also a steady inflow of Green Island's surrounding sea water. This recreates the ideal environment for a diverse range of marine life. There are over 100 species of brightly coloured fish, coral and anemones as well as many other intriguing creatures such as the deadly Stonefish, Mantis Shrimp, Striped Puffer Fish, Epaulette Sharks, Turtles, Painted Crayfish, Barramundi and Lion Fish. In the large pools you can view Green Turtles, Hawk Billed Turtles and other coral life up close. Crocodile shows take place twice daily at 10:30am and 1:30pm, providing an informative talk of the attractions inhabitants. Meet Cassius (5.5 metres), Brutus (4.2 metres) and his girlfriend Babinda (3.5 metres). Being a family operation you will hear first hand island tales and stories. Definitely a family favourite is the crocodile feed! You will also have the opportunity to hold a real baby crocodile - a fantastic experience and great photo! The gift shop features a beautiful range of individually chosen gemstone and coral jewellery including a range of handmade pieces designed and created on the Island using Australian and other gemstones. There is a great range of souvenirs including genuine crocodile teeth and leather. Your ticket into Marineland Melanesia entitles you to re-entry throughout the day. Cassius - the Largest crocodile in captivity! 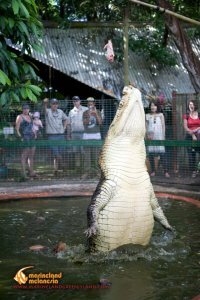 Cassius is the Island's King, at 5.48 metres long, this saltwater crocodile was crowned the largest crocodile in captivity by the Guinness Book of World Records in 2012. 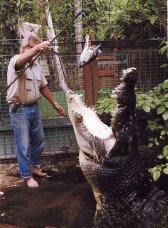 Estimated to be around 110 years old, Cassius is the largest crocodile that has ever been caught alive in Australia. He was captured in 1984, just south of Darwin and taken into captivity after attacking too many boats and biting off outboard motors. He was a problem crocodile with a very aggressive nature, and surely would have been killed if George Craig hadn't saved him. 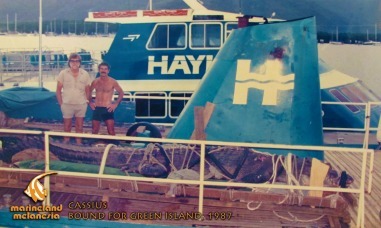 In 1987 George trucked Cassius over 3000 kilometres to Cairns and then ferry to Green Island, where he made Marineland Melanesia his new home. Cassius diet mainly consists of fish and chickens, which has led to his massive growth over the years. The animal now measures 5.48 metres (18 ft 0 in) in length and weighs 2,200 pounds (998 kg). Cassius is fed regularly at the crocodile shows which is quite a spectacle. Quite often George Craig likes to feed Cassius personally and it's quite amazing to witness the special connection he has developed with this incredible animal after nearly 30 years of being his caretaker. But despite being cared for by the zoo for more than a quarter of a century, staff are under no illusions about Cassius’s opinion of them! Cassisus is missing a front left leg, which he probably lost in a fight or to a predator when he was younger and smaller. 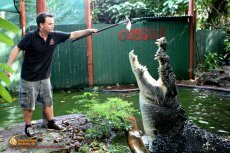 Join friendly and enthusiastic staff for a 30min guided tour and watch as the huge crocodiles are fed. Witnessing a half ton croc launch itself out of the water to grab it's food with several tonnes per inch² of closing pressure is something you will never forget. This is when you will see their true power and realise why they have a reputation as man-eaters! What a fantastic photo! The entry fee allows for all day entry, so join both shows and see different crocs having their lunch! Meet 'Cuddles' and have a special opportunity to have your photo taken with this baby crocodile. There are great photo packages available. 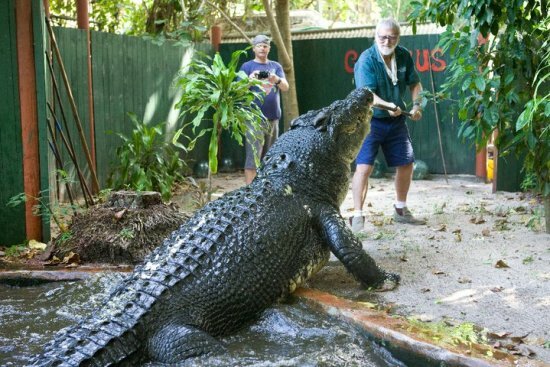 Cassius currently holds the record for 'LARGEST CROCODILE IN CAPTIVITY' in the world. He measures 5.48m or 17'11" with approximately 15-20cm of his tail missing, and is an absolute must see while on Green Island! It took Cassius less than a minute to devour a cake made of chicken necks to celebrate his first birthday party in 110 years! 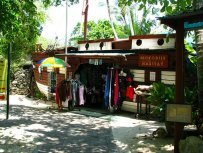 Marine Melanesia is located just a short stroll along the path to the left of the jetty. Look out for our iconic shipwreck entrance. Family owned and operated for over 40 years inside you will find an amazing collection of crocodiles, tribal art, reef aquariums and marine turtles.